Win over the most averse sweet potato eaters this Thanksgiving with this Sweet Potato Casserole with Marshmallows and Pecans. It's a family favorite holiday classic that is made even more delightful with both a crunchy pecan streusel topping and roasted marshmallows on top! Preheat the oven to 350 degrees F. Prick the sweet potatoes all over with the tines of a fork, then place them on a baking sheet lined with foil and sprayed with cooking spray. Roast in a 350 degree oven for 45 minutes to 1 hour, until soft. Larger sweet potatoes may take longer to cook. Let the sweet potatoes cool enough to easily handle them, then scoop out the insides into a large bowl (if using roasted sweet potatoes). Add the butter, milk, brown sugar, cinnamon, eggs, vanilla, and salt, and mash with a potato masher or beat using a hand mixer until smooth. Spray a 9x13-inch baking dish with cooking spray, then transfer the mashed sweet potatoes to it and smooth them out evenly using a rubber spatula. In a separate bowl, combine the brown sugar, flour, cinnamon, salt, melted butter, and chopped pecans. Mix them together with a fork, then sprinkle over the top of the mashed sweet potatoes. Increase the oven temperature to 375 degrees F. Bake the sweet potato casserole for 25-30 minutes, until heated all the way through and the topping begins to brown. 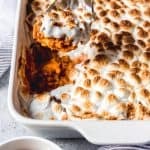 Remove the sweet potato casserole from the oven and sprinkle with the marshmallows. Set the oven to broil, then return the casserole to the oven and cook just long enough for the marshmallows to toast on top. Watch carefully as this can happen very quickly. Serve immediately. Leftovers can be stored in an airtight container. If you prefer, you could peel the sweet potatoes and cut them into chunks, then boil in a large pot with enough water to cover them for 10 minutes until fork tender rather than roasting them in the oven. Drain well then proceed as directed in the recipe.